It happened. And pretty much before I actually realized it. One year. Really? All I can think to myself is: where did the time go? This weekend, I sat down with a box of tissues and some chocolate and read through this entire blog from start to finish. All 119 entries. My first impressions was: wow…I wrote A LOT. This was probably due to having a great deal of time on my hands and all the stimulating newness that was the Solomons. But, looking back, there was something of a catharsis going on. I can read through my process, which involved leaving a place I had grown to love and, more importantly, rediscovering myself after the breakdown of a marriage. While the breakup was far from ugly, the process of self discovery was (and, at times, still is). I made a lot of errors, in retrospect, and fumbled my way through the process the best way I could. A year. Really? How can I write about this year? Sorry, still in shock. Right, where was I…for my readers who love the juicy stuff, here it is. I moved onto a hippy commune with a gay man in February. That was, perhaps, the best decision I made this year. Mattie, my wonderful, kind, loving, amazing housemate has seen me through it all…rough transitions, heartbreaks, bad decisions, hangovers, the works. He has supported me and stood by me. I couldn’t ask for a better housemate or friend than Matt. I’m truly blessed and lucky to have him in my life. Natalia, another French/American popped into my life around six months ago and, after moving here two months ago, makes my urban family pretty complete. Right, more juicy: Okay, so, in April, the divorce was finalized the same week I fell in love, really in love, for the first time since the split. As anyone could easily predict, it was a complete disaster (and this is coming from a woman who works in disasters). This is the problem when your heart has healed completely after a heartbreak, by the time you are over it, you get so excited at the prospect of being over it that, well, anyway, I overdid it, expecting just a bit too much too soon. The less said about that time, the better, I think. By the time I was really over it, I was ready go back home to the States to see Mom and Dad. That was absolutely the best time, I bought far too many shoes and not enough underwear. But moving on...Nothing cements the future more than seeing where you’ve come from and where you have been. For a long time, I felt adrift, by myself, alone and afraid. Going home made me realize that I still have a wonderful group of people who are forced to love me no matter what. Okay, back to the juicy: I returned to Wellington with a hiss and roar, and, as predicted, overdid it but this time in the other extreme of “I’m not going to be the one hurting this time and commit too early” attitude. After having one failed marriage and an unpleasant breakup in my recent past, I had a certain mindset that possibly wasn't very conducive for dating, which was trying to protect myself from hurt. In classic Sara style, I sabotaged some good things. Well, I suppose the best thing I can say is about the situation is that while I can't be proud of my behavior, I can feel at least somewhat comforted that I was honest when it would have been much easier to be less than honest. Now if I can really just get the f**k over myself and the past, I'll be sweet (I think). Right, enough juicy stuff. Work wise, I became a senior tutor at a university. Being a teacher was amazing and I really enjoyed the process. Also, I am about to start something really scary: my PHD. Yep, I’ll be Dr. Sara in three short years. Probably. Maybe. That’s if the literature review process and utter confusion doesn’t do me in first. But, I have one very helpful thing on my side: I’m stubborn as hell and don’t give up easily. So here’s hoping that stubbornness sees me through. It’s been, clearly, an interesting year with unintended collateral damage. Returning meant establishing old friendships and some of those old relationships didn't survive the pressure of re-entry. While I feel sad about that, well, there are worst things in life than losing relationships that no longer work for either party. So I wish those people well on their journey. The other collateral loss was my lack of diving. The thing that kept me sane and going for months in the Solomons, well, I haven't done here because the water is too cold. I know, I'm a wimp...but I hope to dive again shortly. 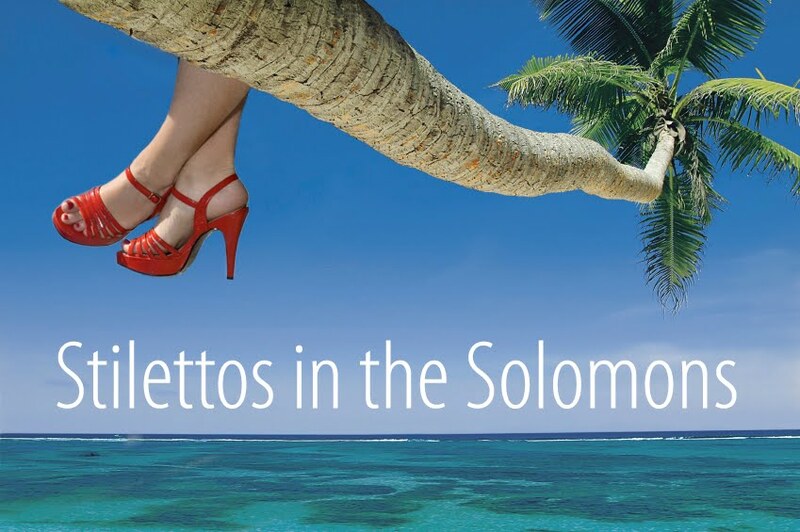 As for the cast of the Stilettos in the Solomons, things didn't pan out the way they had planned either. Tessa and Mackenzie split up soon after I left and that was a traumatic event for all involved. Like all splits where a couple loves each other but just can’t make it work, there were broken hearts on both sides. But that really isn't my story to tell and all I can wish for those involved is a quick healing process. Marco, well, he is somewhere off doing something (I have no idea what) but I get the occasional photograph from one of the Stan countries and he send me emails in Italian, so I have to use Google translator.Viola is happy in Australia, working hard (as always) and enjoying her life (probably, when she isn't over thinking it!). My wonderful and loyal counterpart Tina had a baby boy in March (her last, she claims) and is still working at my host agency. I think of anyone in the Solomons, Tina taught me the most. She always saw the good in me, despite my many flaws and encouraged me to be better. I miss her face, her smile, her eye rolls at my latest debacle more than anything else about the Solomons…we are so opposite but in the core of ourselves, I believe that we truly are sisters. Big events are happening too…weddings are coming up (congrats Will and Lenora, Katie and Sasha and all the happy couples over in the islands). Speaking of weddings, I’m very pleased to be acting as best man for an old friend who taught me more about the Solomons than anyone else. I’m excited, I've never been a best man before, and, while I've got mixed feelings about marriage in general, there could not be a better suited couple. It gives me hope to see that, despite many obstacles, people who are meant to be just…are. In some ways, I chose the wrong year to go. This was no doubt a big year for the Solomons: the Royals came and went from the Islands, as did the Pacific Arts Festival. The Lonely Planet named it number 6 on the ten best places to go for 2012. I feel honoured to have been there before it became a truly cool place to hang out. I hope that it doesn't get destroyed by fast food restaurants, Starbucks, Marriott and all things developed. I’d like to say that I think of the Solomons every day but I don’t. I think about paying my bills, getting dressed, my work and whatever personal issue is troubling me at the time. Like an ex boyfriend, the Solomons pop up on my Facebook from time to time and for a moment I think about the islands and wonder how it is. But the Islands are one of those places almost stuck in time, where everything and nothing changes all the time. If I returned tomorrow, I would only have a handful of friends who would remember me but within a week I’d have a handful of new friends to hang out with. Such is the way of the Islands, long may it remain that way. Life here takes on a pace that is both much faster and slower than the Solomons. Adventure is replaced with routine. I got into a car accident today, a minor fender bender which was upsetting but I kept on throughout my day, shaken up but no worse for wear. In the Solomons, 20 islanders would have come to my asssitance, fixed up my car, given me a cup of 3 in one coffee and kept me company. Here, even with the other driver around, I felt alone. Drivers kept going, people kept walking. I miss the communal life, that taking care of each other. So a year has passed. And what did I do with all my luckiness? I can’t say that I continued with my philanthropy, other than a few short volunteer gigs. I felt like I was exhausted and didn’t have much to give, which is stupid and pretty selfish. I think I’m learning about the small things, that I don’t have to do something big and dramatic like live in the Solomons to make a difference. Looking on now, Matt, my housemate, is the consummate humanitarian, working in mental health. The man receives few, if any accolades and just goes to work, committed to quietly helping others. Or my mother who works at the free clinic one day a week when she could be much more money a day or my dad who didn’t buy a new suit for 15 years so all us spoiled kids could go to University…and this list goes on. For all those people who said when I came back that I did a great thing by going to the Solomons, I would parry that thought with the idea that it was those who stayed behind, worked quietly in the background and kept things going…those are the real heroes, now, to me. I think I didn’t appreciate how intense an experience it is to live there, especially as a volunteer. You can’t hide from the poverty, the violence, the disease…no matter how much you would like to escape it. I have some deep regrets about my time there mainly that I wish I had done so much more. I was capable of more, so why didn’t I give more? Why didn’t I get to know people better or work harder? I know I could beat myself up further but then, I also figure that sometimes we are just there to bear witness to situations rather than needing to step in and stop it. Hopefully that witnessing comforts the sufferer and teaches the witness something so mistakes are not repeated again. Well, that is the hope. It’s my hope. I liked very much your comment about bearing witness. I think one sometimes can not appreciate the significance or meaning of this until many years later. And sometimes bearing witness is of far greater import than simply providing comfort to the sufferer. You carry it forward with you. You yourself are transformed.